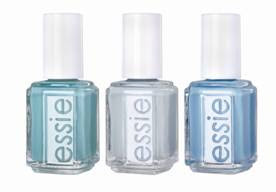 Here's a quick look at Essie's upcoming collection of blues, The North Fork Collection. "Within the soft palette of hues that floated down this season's runways, one color stood out among the rest... blue. Dreamy blues reminiscent of bright open skies and deep welcoming waters lead Essie founder Essie Weingarten to create The North Fork Collection - named for the quaint vacation villages perched around the waters of Long Islan's East End. "The new nail colors remind me of the most beautiful blues that surround The North Fork," says Weingarten. "Tranquil yet playful, the colors cross over in fashion and nature." Greenport, Sag Harbor and Shelter Island, each named after areas around The North Fork and Long Island Sound, are an homage to the beauty of nature." Wow... Essie, is that really you??? A collection of all blues??? Rock on! omg omg omg i am BEYOND excited about these!!!!! <3 <3 <3 LOVE blues! cant wait!!!!!!!!! Great! I'm thinking about ordering some nail polishes, the more I wait the more I add though and I want a light blue. I had considered buying St Bath blue but maybe I'll go with one of these. I was highly disappointed with my Barbados Blue it's a milky blue that looks grey under most lights. Every time I wear it I end removing it after a few hours to put a prettier shade. Very pretty colors. Very exciting to see some different Essie's. I hope they finally "got it". Lena, I think so! They're doing neons again too!! Yay!! Lizzz262, They are so awesome, I can't believe it's really Essie! Amanda, They aren't, how awesome!! Steph NJ, I know they'll look awesome on you! Diann, That's what I'm assuming but I don't know for sure! Shadowy Lady, they are actually very pigmented, I am quite pleased! Karley, WOW! I remember when Hard Candy got famous for their baby blue nail polish (Sky) :) That was a long time ago!